And turn your senses and mind deep within. 11-Min Meds™ (or any meditation practice) can be done with or without chanting, also known as mantra. Some people may dismiss mantra as too “New Agey,” and perhaps dismiss 11-Minute Meds™ as a result. I have found that after teaching yoga for many years most of my students (men and women of all ages) have grown to love mantra, and enjoy it as part of meditation. To that end, I have included meditations with and without mantra so that the reader can choose which way to go. Mantra, also known as Naad or sacred sound yoga, is most effective when rhythm, projection, and pronunciation are all factored in. Many of the Kundalini yoga mantras are based on eight beats, although other configurations are possible. Projection is the outward your life force energy–prana, and correct pronunciation enables the vibratory pattern to resonate throughout your mind, body, and psyche. When the three elements combine, mantra sets up a vibratory frequency for healing, restoration, and transformation. Chanting is not unique to yogic traditions; virtually all the Wisdom Traditions include a form sacred sound. From the “Jesus Prayer” of the Christian mystical tradition to the Icaros of the Shipibo Indians, chanting sacred sounds has a profound effect on psyche-soma. From a yogic viewpoint, mantra is the mental projection of the mind through sound. 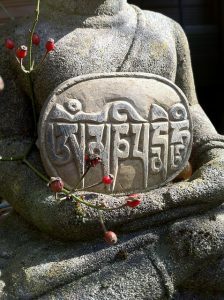 Mantra is not about singing, the sound made while chanting is generated from deep within the navel point and heart center. Mantra resonates up and out. It doesn’t matter if you chant off key–the objective is to learn to find your authentic voice and project it out into the world. Yogic science teaches that the roof of the mouth contains eight-four meridian points, which are stimulated by the tongue’s movement as it rhythmically strikes the upper pallet, much like fingertips on a keyboard. This produces specific and reproducible effects. Mantras are coded to stimulate the hypothalamus, the gateway between the hormonal and nervous system. Stimulating the hypothalamus makes the pineal gland radiate and pulsates the pituitary gland. 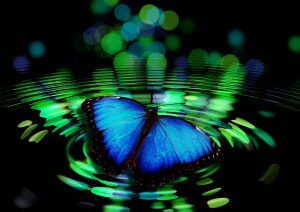 By vibrating a certain combination of sounds, we access deeper levels of intelligence, or consciousness. This in turn regulates stress, anxiety, and depression. Some mantras are vibrated mentally without producing an audible sound. Proper articulation is important and so I have included audio clips so that you will know how to pronounce the sounds, silently or aloud. Next we will explore mantra from its essential component, Shabd Guru and anahat and then move on to the scientific validation of the impact of mantra on heart coherence in order to achieve our goal of stress reduction. The use of “Shabd Guru,” sacred sound current as teacher, is foundational in Kundalini, and many other branches of yoga, which teach that the impact of sacred sound serves as healer and guru (teacher). Shabd comes from root syllables Sha and bd, Sha meaning “expression of the ego,” and bd translating to eradicate or cut off from. Yogic science teaches that the “Shabd Guru” is one of the best tools to strengthen the parasympathetic system and balance the rhythm of the autonomic system so it can repair itself. Essentially the Shabd Guru penetrates the egoic mind vibrationally, allowing one’s true Self to emerge from behind the veil of Maya (illusion). Shabd Guru, present since the big bang, continues its creative pulsation of Infinite consciousness throughout the cosmos. Kundalini yoga teaches that the sages from past centuries merged with Infinity (the ultimate coherent state) and sacred mantras were revealed to them vibrationally, and continues to vibrate through the cosmos today as “unstruck sound” or anahat. Anahat is synonymous with heart center. Although the concept of the primordial vibration of Anahata may seem foreign to us in the 21st century, an example from the 18th century may clarify the essence of the term. Wolfgang Amadeus Mozart was a musical genius who “received” complete works of music all at once. The initial source was pure creative energy (anahat) that he accessed through his imagination, or the imaginal realm of the heart. In his ecstatic state of creativity he was an open channel for divine source. Mozart did not need to sit at his clavier to write music; it was not an intellectual exercise; rather, it was if he had tuned into the frequency of the Divine and was taking dictation. Similarly, ancient yogi mystics “heard” templates of unstruck sound. The vibrational frequencies or naad (essence of the sound) of the chanted sounds vibrate the body and mind in deliberate and specific ways. Mantras contain encoded messages that become imprinted onto the unconscious mine, and break up old patterns of behavior that no longer serve us. New impressions are formed and healthy thought patterns begin to replace old destructive ones. For example, the special rhythmic sound pattern of the Shabd Guru impacts the hypothalamus gland, thus releasing chemical compounds in the brain, impacting the endocrine system. The hypothalamus communicates with the pituitary or master gland, and the pineal gland as previously discussed. By opening the connection bet “Using the Shabd Guru and breath to entrain the rhythms of the hypothalamus and hence the whole body, creates a healing response in the immune system” (Yogi Bhajan). ween the pituitary and the pineal gland, yogic science teaches that this flow releases “inner nectar” called “Amrit.” The brain and entire psycho–somatic system come into synchronization. A pilot study was performed at the University of Arizona using a P.E.T. scan – Positron Emission Tomography to understand the impact of the Shabd Guru. Using an isotope of glucose the researcher’s objective was to determine what changes in metabolism occurred in different areas of the brain. A control baseline was obtained when the subjects performed normal dialogue and walking activities. The test subjects then used a basic Shabd Pattern, i.e., 2 repetitions of the Panj Shabd followed by one repetition of the Guru Mantra Shabd: Sa Ta Na Ma, Sa Ta Na Ma, Wha Hay Gu Ru. The second scan on the same subjects following use of the Shabd Guru showed that “a powerful shift in the function of the left hemisphere to the right frontal and parietal regions. The metabolic shift suggests a strong mood enhancement, countering any depression. The metabolic drop in some regions of the left hemisphere corresponds to a lessening of inner critical voices. The areas of the right frontal cortex suggest alertness and hypervigilence” (Basis, Use and Impact of the Quantum Technology of the Shabd Guru. A contemporary perspective of the exploration of the Shabd Guru and the Information Age). Simply put, this study suggests that chanting specific mantras can have a notable effect on body-mind, resulting in positive emotional states and enhanced brain function. Mantras were passed from one generation to the next and held in secret. The final guru of the “golden chain” (sages of Kundalini yoga) is not a person; rather, the sacred sound current of Siri Guru Granth Sahib. 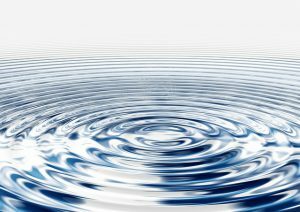 The sound currents contained within it tames the ego, thus revealing Universal truth for all. I am not approaching mantra from a religious perspective in this book–there is nothing to believe or not, we’re merely setting up vibrations that resonate through the body-mind and have a measurable effect through HRV feedback. It is not necessary to understand the translation, although it is always provided. The following example of mantra technique used in Kundalini yoga illustrates a the rapid impact that sound current and intention have on the autonomic nervous system thus bringing the practitioner into a state of psycho–somatic coherence. 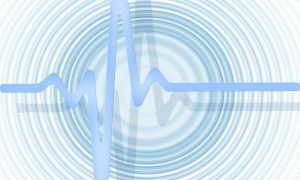 In order to bring evidence-based proof that mantra, sound current, has a measurable effect on the body the following meditation with mantra was performed by the authror along with HRV feedback. For information on how to do Shabd Kriya, please go to the section in this chapter entitled Shabd Kriya. The two following HRV graphs were obtained during a fifteen-minute session of Shabd Guru meditation. HeartMath® desktop software was again used set at level three challenge, four being the most difficult. Note that at the start of the meditation the practitioner, the author, was in low coherence, evidenced by 100% in the low zone and high amount of activity in the LF zone (dark band on left). 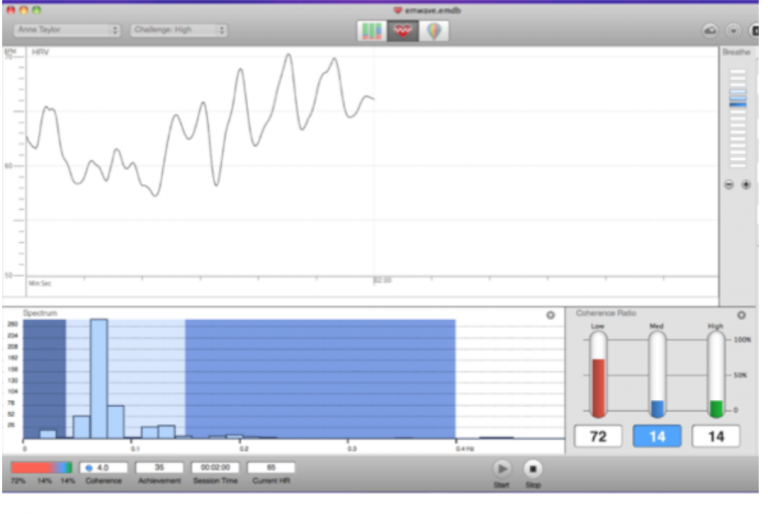 Figure above HRV at 45 seconds during Shabd Guru Meditation. HeartMath® emWave Desktop™ software, level three challenge. The HRV waveform in the top portion of the window is erratic indicating that the heart is not generating a smooth coherent pattern. Most of the autonomic activity is concentrated towards the left side of the bar graph heavy in sympathetic activity (dark blue on the left). 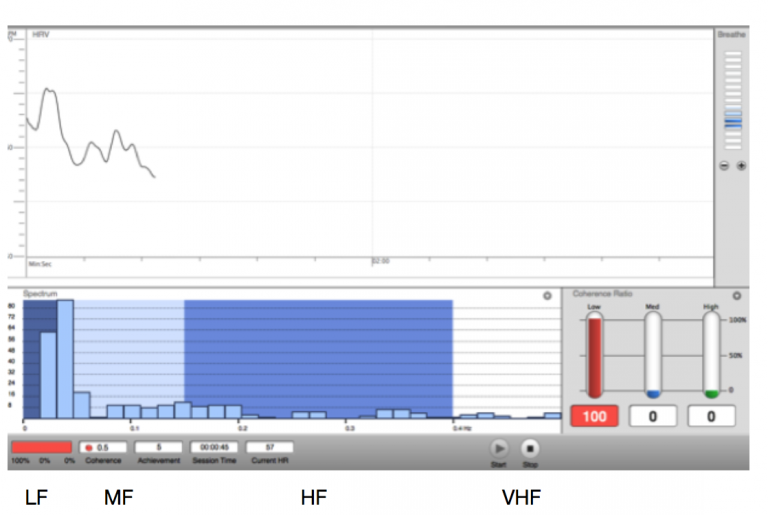 The frequency domain of HRV is less than 0.05 Hz. A quick glance at the thermometer shows 100% red, or low heart coherence. One doesn’t need to be technical to read the color coded thermometers. Red is low, blue is medium, and green is high heart coherence. At the four-minute mark, coherence improves significantly. The waveform data begins to approach a sine wave pattern (top graph), indicative of improving coherence. The frequency domain data is now concentrated in the light blue section of the bar graph. Again, a quick look at the thermometers now shows the blue thermometer is active based on the 14% indicator being highlighted in blue. Coherence is sustained at the 13 minute 44 second mark as shown below. Medium and high coherence taken together increases to 72%, while low coherence drops to 28%. HRV during Shabd Guru Meditation at 13:44 minutes/seconds. HeartMath® emWave Desktop™ software, level three challenge. In fifteen minutes of practice the practitioner was able to shift from low coherence into sustained levels high of heart coherence. When practiced daily one’s baseline level of coherence begins to rise, which is key to building a resilient nervous system. Kundalini yoga teaches that after months of practicing the Shabd Guru Kriya meditation the rhythm of the breath becomes imprinted onto your subconscious and the breath will eventually take on this pattern autonomously. This is the phenomenon known as anahata, described earlier. Kundalini yogic philosophy teaches that the nervous system vibrates the frequency of the mantra and resonates throughout one’s entire being. A strengthened and balanced nervous system is required to resonate with the frequency of the Infinite, the source of naad, or sacred sound currents. When a yogi chants, his or her nervous system becomes synchronized and coaxes the ego to surrender to the rhythms of the higher Self. In their non-ordinary states of consciousness, Samadhi, the yogis delighted in the blissful imaginal realm, anand, and captured the mantras revealed to them in their ecstatic states, which they transcribe into rhythmic mantras that encapsulate the essence of the meaning. Is like the sun shining in the sky. The Self appears other than what it is. It may appear smaller than a hair’s breath. But know the Self to be infinite.